An Oval 6X4mm Emerald forms the center of the flower design. The floral design is completed with White Diamonds that weigh about 0.24 CWT in total. These tiny diamonds are aligned all around the Emerald. 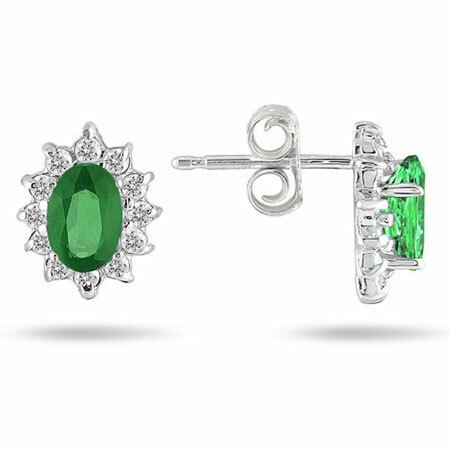 The elegance of the bright green emerald will reflect on your face. It will look great when worn with dress similar to the color. The size is perfect for working women. You can wear it to work and get pleasant compliments from your colleagues. Buy this excellent pair of earrings if you are someone who loves to stay in style. This gold stud is the right blend of durability and fashion. We guarantee our Genuine Emerald and Diamond Flower Earrings to be high quality, authentic jewelry, as described above.